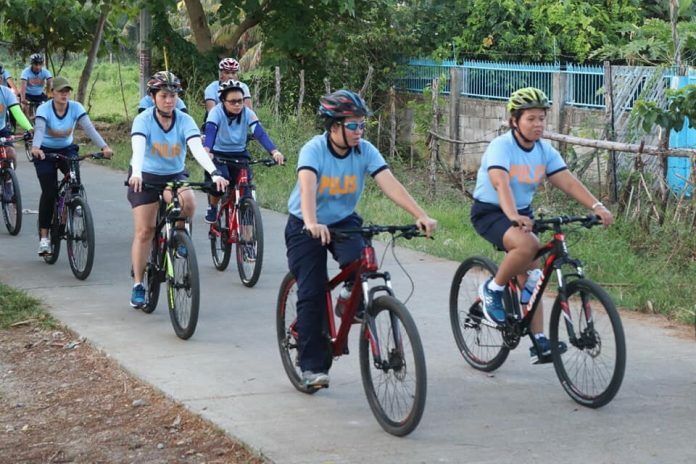 NAVAL, Biliran– Aimed to stave off criminals in the community, the Biliran Police Provincial Office (BPPO) Ladies Club recently launched the Lady Bike Patrollers. PCI Lilibeth Morillo, BPPO police community relations chief and president of the Lady Bike Patrollers, informed that the group is composed of more than 50 lady police personnel and non-uniformed personnel (NUP). It aims to roam around the community and nearby establishments particularly schools to interact and observe behaviors in the community which could possibly result to criminal activities. Dating in dark secluded places of youngsters had been reported to the police which can be a risky behaviour among the youths. Overloaded vehicles, minors who are driving, and smoking in public places are a few more violations that the lady cops target to curb or better yet to cut. The Lady Bike Patrollers visit communities during daytime especially during end of school classes in response to reports that some exhibitionists, likewise, are waiting in less populated streets showing off their private parts to passing school girls, according to Morillo. The lady cops, which held its launching on August 28, visited and distributed flyers in Western Biliran High School for the Arts and Culture (WeBHSAC) in Brgy. Tamarindo, Almeria, and at the Naval School of Fisheries in Naval town. The activity was a prelude to the observance of the crime prevention week celebration on September 1-7.